Stop the Scottish Government poisoning eagles. In recent years I have been visiting the island of Islay due to its dramatic wildlife which is a big winter destination for many tourists to witness the 50,000+ geese that arrive mainly from Greenland, and the dramatic landscape of the island offering habitats for so many other birds especially eagles. Islay is the most fertile of the western isles of Scotland and is farmed for grass for the cattle and barley for the many distilleries on the island. Large amounts of fertiliser are used to create all this grass offering the geese a great place to come and graze as most cattle are confined to winter quarters as they would damage the sword by ‘poaching’ the grass. In recent years the Scottish government have been paying the farmers for having the geese on their land [£913,625.03 in the winter 2015/16] as well as farms receiving ‘single payment’ for the hectares of land they own and some on agricultural improvement schemes. Now we find that as well as these payments farmers can actually shoot the geese which draw tourists to the island! The geese being targeted are the Barnacle Geese which have come from Greenland. The reason for this shooting is that farmers now feel , regardless of being paid for having the birds on their land, that the geese can do damage to newly sown grass. Not only are a number of geese shot but they are shot with a lead based shot which can cause damage to the birds not aimed at by ingesting the lead once it is fired over the land. Along with the Barnacle Geese is another goose from Greenland, actually called the Greenland White fronted Goose. This bird has the highest conservation priority, with species needing urgent action to stop their decline and although not shot at can also digest the lead fired over the fields. This happens more often when the fields are wet which is a common feature in winter and water areas attract the geese to drink and look for grit to digest their grass food. Lead is taken up as grit and broken down in their gizzards before being digested into the blood stream. Both species can accumulate lead this way. Lead is not used when shooting over permanent water like lochs and rivers as it was banned due to this poisoning of the wildfowl living on them and the Islay gun men need to change their ammunition to a ‘non lead’ shot if they shoot over these permanent waters and SSSIs. It has come to my notice that the island employs 2 gun men to do part of this job of shooting geese. They are paid £32,000 between November and March. They are also given money for their shot totalling £4,473.54 in 2015/16 season. Hopefully these marksmen do actually kill all the geese they aim at! But individual farmers can also apply for a license to shoot geese! None of these farmers have to have any training with a gun so the potential of wounding a goose is increased. Both have to clear the fields of the dead geese but wounded geese can move away to die a slow death. My trip in November 2016 produced several eagles feeding on dead geese. These were mainly White tailed Eagles but also Golden Eagles were present but not seen feeding. The problem starts now! These eagles are eating geese carrying lead. 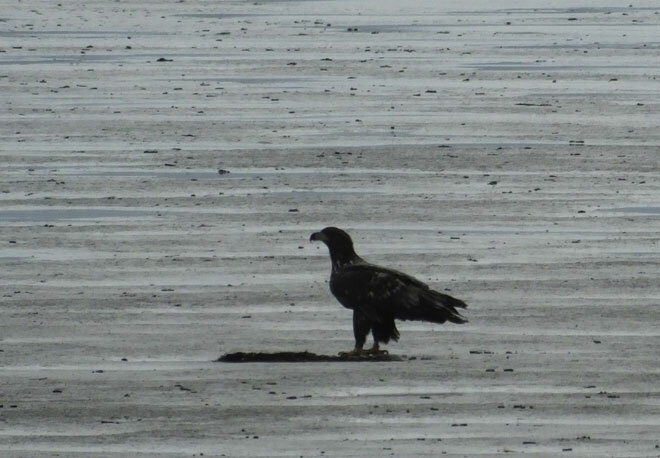 In one incident a first year White tailed Eagle was seen on top of a live Barnacle Goose. It started plucking but soon moved around 50 yards to feed on carrion of another goose. All this was happening on the RSPB reserve at Loch Gruinart where there is no shooting of the geese! These wounded birds had moved to the sanctuary to die a slow and lingering death! With a possible living age of around 20 years this lead will build up in these eagles and finally kill them. No dead eagles were present during my visit as most where first year birds. Eagles are not only at the top of a ‘food chain’ but the top species to be seen in Scotland’s Wildlife Tourism industry. A Scottish Government paper – http://www.gov.scot/Publications/2010/05/12164456/0 put the income from all forms of wildlife tourism at £156 million employing 7446 employees. So how can a government still encourage the use of lead and even supply it for it to contaminate eagles? The eagles are not just exposed to lead on Islay but more geese on Orkney are being shot with lead thanks to another government backed scheme. Most Red Deer have their ‘innards’ removed and left on the hill for eagles to eat. The majority of deer have been shot with lead! From the same Government paper you can see where key species are removed the wildlife tourism industry declines noticeable on the east side of the country where Red Grouse and Pheasant shooting takes place. 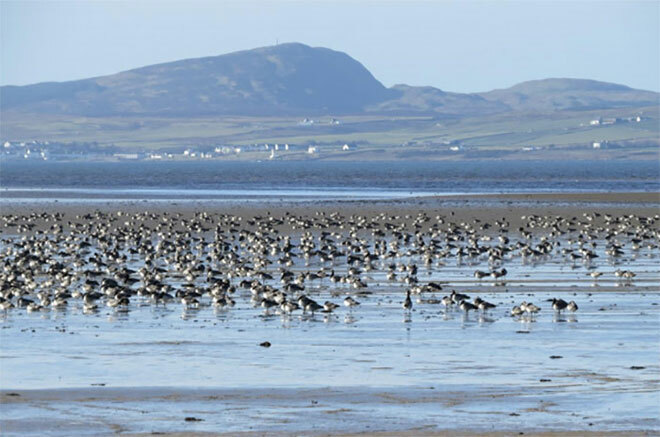 Islay would be a much better for wildlife tourism if the Scottish Government banned this lead and better still banned the lead over the whole country allowing eagles, other birds of prey and mammals not accumulate this lead. Lead has been removed from several human uses especially in petrel, paint, piping, toys and fishing tackle due to its poisonous effect. May be an E petition will be the only way to bring this to the public’s attention as they pay for the lead on Islay! So regardless of which party you support remove this lead from the environment of Scotland and let wildlife flourish making more money for wildlife tourism. 8 comments to Stop the Scottish Government poisoning eagles. John do the wild fowl regulations which forbid the use of lead shot for wildfowl shooting not apply in Scotland or if they do are they being flouted as in much of the rest of the UK. Most wildfowlers apparently do follow the rules. It is those other, often commercial shoots which finish the day at ducks and geese who apparently do not in many cases. The “innards “or gralloch left on the hill for eagles to eat does not contain lead and is safe for any bird or mammal to eat. The gralloch is the dijestive tract and spleen. Deer are shot in the chest or neck and even if a lead based round hit the guts it would not expand pass straight through and be buried in the ground. The area with possible bullet fragments leaves the hill with the beast and is removed by the gamedealer/butcher when the animal is processed. It would not take a lot to insist those shooting and recieving funds from the government use lead free shot and it may already be the case. If there are dead and dying geese lying around on RSPB reserves it would be sensible to pick them up if you are concerned about lead. It is worth noting that the use of lead shot to shoot wildfowl is prohibited in England and Wales but not in scotland and Northern Ireland. I wonder what tests have been done on deer to see the spread of the lead fragments? I notice Denmark have banned lead completely! We have a friend who comes here to shoot deer from Denmark and he still used steel shot. It also seems that FC are moving away from lead. Must be a reason! John I think you are confusing shot and bullets. Non lead deer rounds are copper or copper alloy while non lead shot for shotguns can be steel or an exotic alloy. Lead cored bullets for deer stalking can break up on contact with bone but the lead fragments end up in the bin as any area containing them is a bloody bruised mess and is discarded. Any tissue in a deer that shows a haemorrhage is discarded along with the lead. The Danes have not used lead for over 10 years, FC and RSPB do not use lead. The argument claiming lead bullets pass through deer undamaged is clearly wrong when you look at the problem of lead poisoning in Californian Condors. Clearly we should expect that best practice is followed and that means minimising lead in the environment, hence no lead ammunition should be being used anywhere in the UK. Lead bullets pass through soft tissues unless they hit a bone. The shot deer is removed minus the gralloch so lead fragments leave with the dead deer and are removed by the butcher where the damaged tissue is dumped. Perhaps in the USA they are in the habit of leaving shot dead animals on the hill a rare practice in Scotland unless you are The John Muir Trust. We are not talking about deer but geese presumably shot with shotguns and it has already been clearly demonstrated that even if the pellets and visible fragments are removed that because of microscopic fragments the meat can contain many many times above the legal limit for lead in farmed meat. However these geese are presumably wounded and not recovered still contain all or very nearly all of the lead they were shot with. Natural carrion feeders are many times smaller than us so it is easily possible for them feeding on such carcases to consume a damaging amount of lead, this is not about deer grallochs. We know what happened to swans with lead fishing weights it is perfectly possible for the same to happen to eagles eating shot geese. There is no justification in this day and age to be using lead ammunition. As I understand it the John Muir Trust use non lead ammunition.